As a part of Commision of Elections' way to showcase the Presidentiables and their platforms, Comelec prepared a series of debates which were assigned to be held in Luzon, Visayas, and Mindanao and will be covered by their respective media partners. 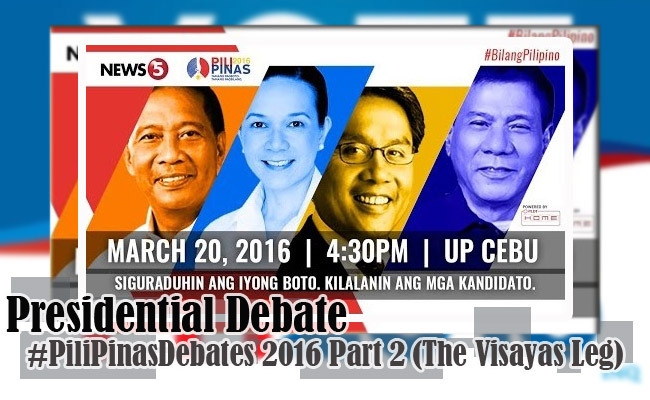 The first part of the #PiliPinasDebates2016 was held at Capitol University in Mindanao on February 21 (Sunday) that lasted for 87 minutes. The Mindanao leg was hosted by GMA News and Current Affairs and their anchors; Mike Enriquez and Jessica Soho. On March 20 (Sunday), the second leg was conducted at University of the Philippines Cebu in Visayas. 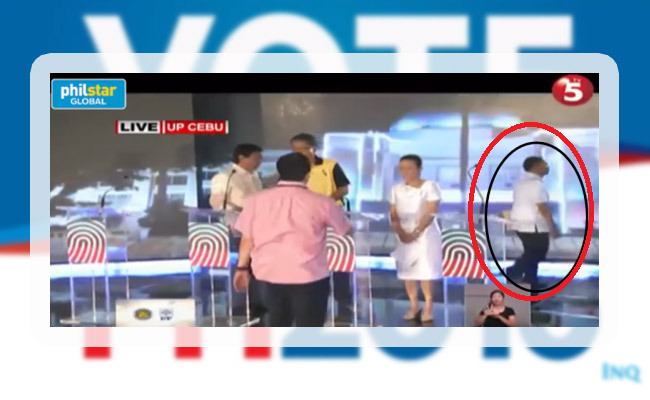 However, the Visayas leg started more or less an hour and a half behind the scheduled time of 5 PM because Vice President Jejomar Binay insisted of bringing notes and/or documentations during the debate which was prohibited by Comelec. TV5, the partnered media on the Visayas leg, insisted that the delay was not their fault. TV5 also claimed that they were prepared, and the delay was due to the misunderstanding however the network still apologized for it. The Visayas leg also lacked Senator Miriam Defensor-Santiago who was absent because of her scheduled treatment. Anyhow, this 2nd debate was considered far more feisty than the first. The debate was divided into two rounds. The first round was a series of questions by the journalists. Each candidates will have 2 minutes to answer the questions thrown at them. The other candidates have 30 seconds to react and another 30 seconds were alloted for rebuttal. In this round, issues regarding the Freedom of Information (FOI) bill, infrastructure, crime rate, drugs, health, education, income tax exemption, Coco Levy, and climate change were discussed. Senator Grace Poe was notably aggressive in answering the issues regarding FOI and the Coco Levy issue vs. Danding Cojuanco who was a known supporter of the senator. She was also attacked by VP Binay regarding her citizenship. Binay pointed out mainly that a person who denounced and abjured her citizenship just to acquire a green card is not a real Filipino. But their dialogue spiraled to corruption and cases filed against Binay. Prior to that, VP Binay dared his co-candidates to sign a waiver to authorize a money laundering council to check their bank accounts and lifestyles. These documents were the reason why the debate was delayed. The moderator and host Luchi Cruz-Valdes prohibited Binay to exhibit his documents to abide Comelec's rule of not bringing any notes and/or documents during the debate. Furthermore, Binay was asked how will he implement his propositions of massive infrastructure if he, at the same time, will exempt the tax payers who are earning P30,000 and below from income tax. The tension became more thrilling when Mayor Rodrigo Duterte had been contentious against DILG Secretary Mar Roxas after the latter expressed his doubt if Digong is really capable of eliminating drugs in the country within 6 months. During their heated conversation, Digong also dug out Roxas' "pretentious" claim that he graduated from Wharton and hit the former secretary about his inability to kill and to die therefore will become an inefficient leader. Digong also blamed Roxas for the ongoing crimes, especially regarding drugs, inside the correctional facilities. Meanwhile, Sec. Roxas highlighted the achievements of Daang Matuwid and the things he will continue and improve. He also shared a dialogue with the vice president when Binay accused Roxas of corruption according to Vitangcul. In the second round, candidates asked another in a pre-determined order. Each candidates have 3 minutes to answer and 1 minute each for reactions and rebuttals. The first to ask was Binay to Digong. But Binay refused to ask any questions as he believed that both of them are qualified to be President. Digong, on the other hand, returned the gesture by complimenting the vice president and said that Binay was more qualified than he is. But, Digong took that back in a very witty way of saying, "Naniwala naman kayo" then shook Binay's hand. When Digong asked Poe what will be her first step as a President if China will attack Phil. Coast Guards in the middle of the night, Poe said that she will wake right away. She will contact DOTC and will strategies with them. Poe also had outlined the need to strengthen our AFP. Next was Poe to Roxas. Poe questioned PNoy's trust in Roxas during the Zamboanga siege where PNoy went to Zamboanga personally to give the orders to AFP instead of letting DILG Sec. Roxas to take control. Senator Poe also highlighted the Mamasapano encounter where Roxas was bypassed and wasn't informed of the operation. Roxas had not addressed the questions quite well there. Lastly, Roxas gave Binay the opportunity to clarify and defend himself regarding the allegations and cases filed against him. Which Binay answered that they were entitled to buy expensive things and one should not always need to look at prices but quality. According to few, the debate had sated the public's interest to witness a more honest, straightforward and courageous debate that tackled relevant issues compared to the previous one which was more wholesome. Netizens also commended the moderator Luchi Cruz-Valdes for keeping herself calm and for showing professionalism during the entire event despite the heated arguments. Meanwhile, it also had been noticeable that VP Binay left the podiun right after Luchi wrapped up the debate while the rest stayed for a while to shake hands and greet the journalists. The next and final debate will be in Dagupan (Luzon) on April 24 (Sunday) at 5PM and will be covered by ABS-CBN.